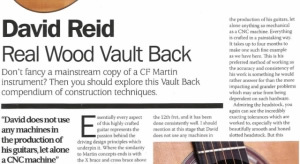 Don't fancy a mainstream copy of a CF Martin instrument? Then you should explore this Vault Back compendium of construction techniques. "David does not use any machines in the production of his guitars, let alone a CNC machine"
Essentially every aspect of this highly crafted guitar represents the passion behind the driving design principles which underpin it, where the similarity to Martin concepts ends is with the X brace and cross brace above the soundhole. Other than this aspect, each component part of the Vaulted Back guitar is made by hand in the holistic sense of the term and is something which has been considered by David to add quality to the playing experience of the instrument. An example of this is the edge of the fingerboard. Rather than simply nicely finished by hand and sanded to a bevel, here we have a scalloped edge which makes for a very natural match to your left hand. This has been performed for each fret spacing both on the treble and bass side of the guitar neck up until where it joins the body at the 12th fret, and it has been done consistently well. l should mention at this stage that David does not use any machines in the production of his guitars, let alone anything so mechanical as a CNC machine. Everything is crafted in a painstaking way. lt takes up to four months to make one such fine example as we have here. This is his preferred method of working as the accuracy and consistency of his work is something he would rather answer for than the more impacting and grander problems which may arise from being dependent on such hardware. Admiring the headstock, you again can see the incredibly exacting tolerances which are worked to, especially with the beautifully smooth and honed slotted headstock. But this really is just the beginning. The soundport on the upper bass side and cleanly executed purple heart armrest are labour intensive features and are very welcome, yet they pale a little into insignificance when you discover the research and development that has been laboured over to produce the gregarious walnut and cherry sequences back and sides (also sandwiched between more purple heart stringers), the cleating and gluing together of each piece, and inlay soundhole decorations. But there is more yet still to marvel over ~ within the guitar's bracing itself. Having studied materials science and guitar building professionally for several years, David has pioneered a bespoke approach to bracing with the intention of honouring the separation of tonal frequencies from the bass, middle and treble ranges of the guitar to great effect. The treble side employs higher, stiffer and tapered spruce bracings as opposed to lower-profile and rounded bass side bracings. The former have hollowed sections to improve the sound table's mid response while at the same time providing strength to the top from its lower part and absorption of the compression forces exerted on the soundhole area. It is true to say that this guitar has a tone of its own. It's not like a Taylor or Martin but has its own lightness and spritely definition which is much admired by those who have purchased one. It allows as much top vibration as it can while under the compression forces of the bridge and neck pulling up and away from the soundhole, and this makes for a good sustain and brings a ringing clarity to your phrases. Wood itself possesses a higher tensile strength than that of steel and so maximising this quality has been a key part, keeping the top well braced and yet flexible enough to produce a great projection and tone. The lower part of the treble braces achieves this required level of rigidity, whereas the upper cross member accommodates the forces of compression that the top of the guitar is under. Hollowed mahogany braces are also deployed strategically to complement the guitar's frequencies rather than dampen them, and overall you can indeed hear a good tonal separation of notes from the respective frequencies at your disposal. Additionally, one of the treble braces is 'sprung' to further relieve forces on the top as it absorbs them and returns this energy back to the top, promoting further sustain and ultimately the longevity of the guitar. You should not expect to see a collapsing soundhole on this guitar in 10 to 15 years time - or perhaps even 20 - given the architectural level of detail within its infrastructure, so you should continue to sound good for the best part of decades at least. The top is fine, even grained, cross-siked Sitka spruce, The back is a stunning combination of Spanish walnet and English cherry ~ The Cuban mahogany neck also features a strip of purple heart. This is a detailed and highly artistic guitar in its aesthetic appeal and outgoing personality. indulgence. It's a Picasso rather than a Constable - acoustic art for the most discerning of players with a healthy budget. What did our test results reveal? Pros: Unique. Work of art. Supplied with Calton hard case. Exclusivity Playability. Cons: No electronics within the price. 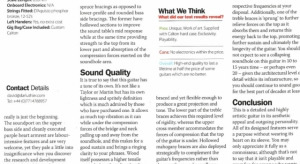 Overall: High-end quality to last a lifetime at half the price of some guitars which are no better. How well did this guitar fare?